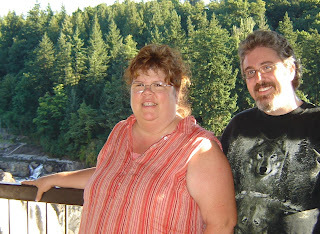 So today we took a short road-trip to several local destinations, including Snoqualmie Falls. These falls are probably more spectacular in the winter when the water level is high, but at 270 feet, they're still a breathtaking tourist attraction around these parts. And being that we were playing tourists in our own state, AND tour-guide for Shaun, we decided this was worth a stop. Of course we took a few photos from the observation deck, it's a very picturesque spot, even if our mad photo skilz don't show it. Since it was blistering hot and we had tourist-sort of shoes, we decided NOT to hike the crazy-steep straight-up-straight-down hike to the bottom. 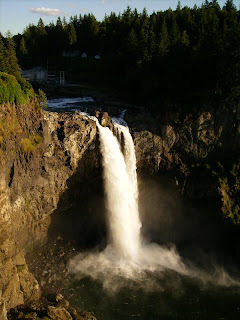 You may recognize Snoqualmie Falls and the Salish Lodge (located directly above the waterfall) from the opening credits of the short-lived 90's cult classic "Twin Peaks" television series. (Yes, I'm a huge fan). We took a moment to look around the lodge as well. There is a lovely gift store as well as an elegant award-winning restaurant (which I won't be able to afford any time soon, though I hear rumors that they'll custom create a fabulous vegan plate if notified ahead!). 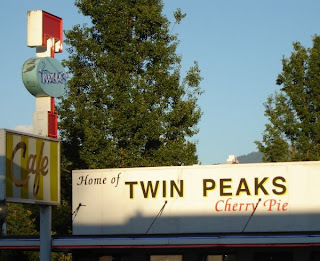 On our way home, we stopped for coffee, and (non-vegan) ice cream for the (non-vegan) kids, at Twedes, the town's diner, known as "The Double R" during the filming of Twin Peaks where producer David Lynch immortalized their cherry pie. 18 years later, it's still pretty famous, I guess the sign helps. OK, OK, enough of the TV-series trivia (for now). We had a great day. 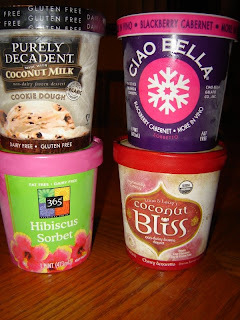 And since we adults chose to opt out on the non-vegan ice cream, we went a little nuts when we passed the grocery store on the way back home, indulging our vegan ice-cream craving in a crazy-good way! Behold, choices to make ANYONE happy! Sorry, no recipes today, you'll have to enjoy the ice cream! I love waterfalls, and that one truly is spectacular! Wow, the falls are beautiful! 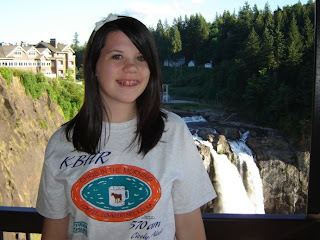 They look so different than my local tourist attraction falls, Multnomah Falls even though you're only one state away! Wow, awesome waterfall! So pretty! I've seen that Ciao Bella brand, but didn't realize it was vegan. Then again, I guess all sorbet is vegan. But Blackberry Cab?! That sounds heavenly. I'm a bit of a wino. And the falls are beautiful! How lucky that you live so close! Those falls are gorgeous! What a great summer road trip destination. blackberry cabernet sorbet sounds right up my alley! what a great trip indeed! you are a really good mommy, i hope you know that. i wish my mom had taken me on trips like that as a kid. No recipes needed. Sometimes it is just nice to catch up with what you've been doing. Am going to try the recipes from your previous post as they sound delish and just the sort of stuff that me and dd love! Wonder if you can make vegan ice cream easily, without an ice cream maker? Those falls look spectacular! I love visiting waterfalls of all sizes. I've been eying that Ciao Bella sorbet, glad to know it's worth buying.